Small - $39.99 Large - $39.99 Only 1 left! X-Large - $39.99 Only 1 left! Everyone knows and loves the classic jingle about a poor elderly woman being the victim of a hit and run. Now you can easily get that catchy tune stuck in the heads of your friends and family. Once the Christmas season starts up you can start wearing this Granny Got Run Over By A Reindeer Ugly Christmas Sweater and entrap the lovable ditty in everyone’s mind! It’s cuddly, it’s warm, and it will be perfect to wear while enjoying your winter nights wrapped up in a blanket with a cup of hot cocoa. Of course, if you’re more of an active person then you can enjoy dancing around at all the ugly sweater parties you're invited to over the holiday season. This sweater is so ugly that it’s almost cute… in an ugly sort of way. 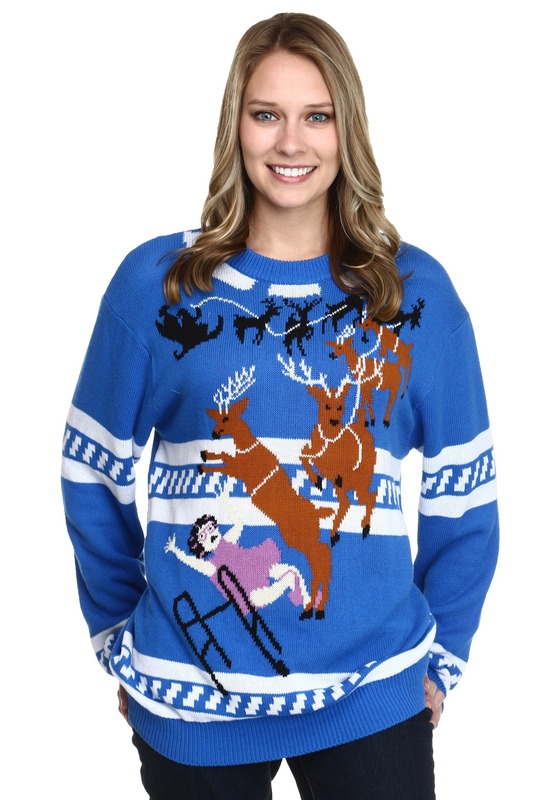 Whichever way you decide to spend your holiday this year, just make sure you’re staying nice and toasty with this humorous novelty sweater! Ordered a medium (Im usually L) but looked like it ran big and it’s still a little big.